Floating covers control odors from waste water and manure ponds by preventing the evaporation of volatile ingredients into the atmosphere. By keeping ammonia, hydrogen sulfide and other odor causing chemicals trapped in the water, the floating cover prevents odors from leaving the property.All of Layfield’s floating covers can be used for odor control. The presence of the cover on top of the liquid will help keep odors in the liquid. 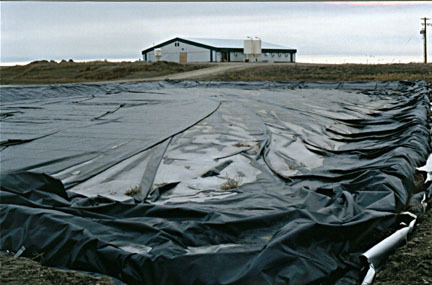 Once a cover is placed anaerobic conditions can be created and biogas produced. In certain cases this can be used with a biogas collection cover, but in other cases the biogas is vented or flared to prevent the cover from being lifted off the liquid surface. When considering an odor control cover Layfield has a number of designs that can address the operating needs of the pond. Call your local Layfield office to discuss your next odor control cover.